alicia policia: Git Along, Little 'Dillo! Whoopie-ti-yi-yo, git along little 'dillo! 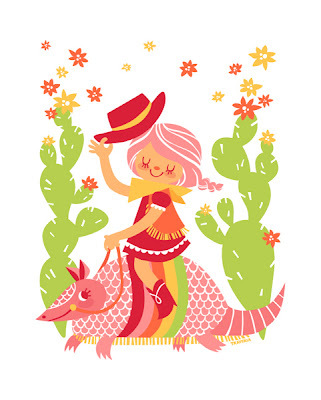 Just a cowgirl, an armadillo, a coupla cacti, and some super cuteness. You know, it is kinda hard to make an armadillo look cute. Opossums, sure, no problem! But armadillos? They aren't so cute. However, I feel cuteness has been achieved. The key to it all is the eyelashes, says I. And a rainbow band of stripes doesn't hurt, either. I think I'll have to do this one up as a print, too. I should get on that, shouldn't I? I should (adds item number one million to the list).